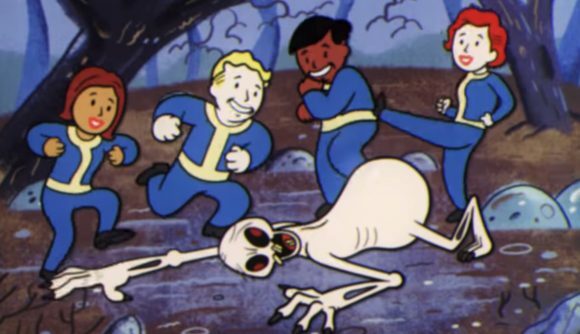 One of the biggest concerns attached to the reveal of Fallout 76 was what would happen to griefers. In an online RPG, there’s very little stopping some players from ruining the experience for others. Thankfully, however, that’s something Bethesda has discussed at length, and as a result there are plenty of options when it comes to disciplining violent players. We already knew that Fallout 76 would include a bounty system, punishing murderous players by rewarding anyone who takes them down with a bunch of caps. The kicker is that those caps come from the original murder’s wallet, so killing quickly becomes an expensive hobby. But what if you try to game the system? What if you go on your killing spree without a cap to your name? Can you get away with your crimes? Thankfully not. In an interview with VG247, Bethesda VP of marketing Pete Hines said that once your caps hit zero, if you still have a bounty to pay off, you’ll take a massive debuff, tanking the amount of damage you deal to both other players and the game’s PvE elements. Hines says that “for two hours in the game, you’re going to be spitting spitballs at enemies to remind you that you’re a murderer.” The penalties will only impact you if your victims doesn’t shoot back, and Hines makes it clear that PvP is still viable if both players are into it. Otherwise, you’ll be next to useless for two hours of real, in-game hours, and the clock won’t run down if you log out – if you can’t do the time, don’t do the crime. You can check out what we already knew about the Fallout 76 wanted system, and read into what else Bethesda has planned to deal with griefers. The Fallout 76 release date is getting closer – it’s November 14, so you won’t have to wait too long to head into the Wasteland yet again.